A new top-of-the-line U.S. guided missile destroyer with missile-tracking radar was deployed to Japan on Saturday, as tensions mounted over neighboring North Korea's recent missile tests. Meanwhile, South Korea has said it will suspend planned shipments of food and fertilizer, echoing a decision by Japan to also not help North Korea, reports CBS News correspondent Barry Petersen. Although the missile launch was ordered from the top, it's the ordinary people that will suffer, says U.S. envoy Christopher Hill. "People who don't have enough to eat, people who don't have enough clothes, enough electricity — and meanwhile they have a regime firing off missiles," Hill told Petersen. The USS Mustin arrived Saturday at Yokosuka, homeport to the U.S. Navy's 7th Fleet, with its crew of 300 sailors for permanent assignment to the region, said 7th Fleet spokeswoman Hanako Tomizuka. The move comes as the United States restructures its regional defenses amid growing concern about the nuclear ambitions of North Korea, which stunned northeastern Asia on Wednesday by test-firing seven missiles. In August, Yokosuka will also welcome the USS Shiloh, which last month demonstrated its ability to shoot down missile warheads in a landmark test off the coast of Hawaii. The Mustin, commissioned in 2003, is one of the most advanced in the fleet, but its deployment to Yokosuka was previously planned and not made in response to North Korea's latest missile shots, Tomizuka said. Both the Mustin and the Shiloh are equipped with radar systems that employ so-called Aegis technology that is geared toward tracking and shooting down enemy missiles. The system was instrumental in identifying and assessing Wednesday's missile launchings, which all fell apparently harmlessly into the Sea of Japan. 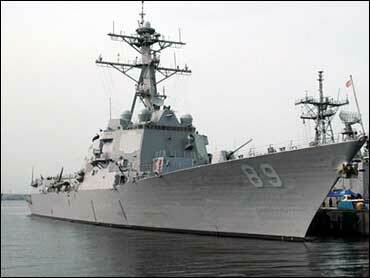 The U.S. Navy now has eight Aegis-equipped vessels at Yokosuka, Kyodo News agency reported. Also Saturday, Hill rejected North Korea's demand that Washington lift financial measures against the regime, but he backed a Chinese proposal for an informal meeting of countries involved in six-party talks on Pyongyang's nuclear weapons program. The U.S. envoy dismissed a North Korean demand that the U.S. drop its crackdown on the regime's alleged financial crimes, such as money-laundering and counterfeiting. North Korean media devoted coverage Saturday to the 12th anniversary of the death of President Kim Il Sung, the national founder who was succeeded by his son, Kim Jong Il, in communism's first hereditary transfer of power. "At the same time that Japan, along with the U.S., France, and the U.K. are proposing tough sanctions at the U.N., the U.S. has offered to meet bilaterally with North Korea at the sidelines of six-party talks, if they are resumed," CBS News Foreign Affairs Analyst Pamela Falk. "The challenge for U.S. negotiators will be to determine how to both protect the American public and to get the North Koreans back to the 6-party talks in light of the dangerous provocation that was caused by the July 4th launch of missiles," adds Falk. "The next step is likely to be diplomacy and all hands on deck at the U.N. Security Council on Monday morning." "The reason that the launch is so threatening is because of North Korea's nuclear capability and because they pulled out of the Non Proliferation Treaty three years ago," Falk says.